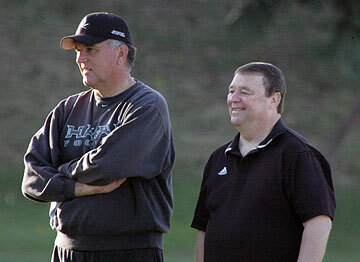 Greg McMackin, right, is the leading candidate to become June Jones' defensive coordinator. Hawaii football coach June Jones wants Davone Bess and Ryan Grice-Mullins to know the Warriors offense inside-out. That's why the two stars at the inside receiver, or slotback, positions are moving outside this spring and running routes from the wideout posts. "We want to put Davone and Ryan in some different positions with some different routes. I want them to learn the outside, they know the inside," Jones said after yesterday's first of 15 spring practices. "And it'll give us an opportunity to give the younger guys a lot of reps inside." Bess, whom Jones is also considering as a punter, said he'll do whatever's asked of him. "I'm just following the leader. Whatever it is, I'm down for it," said the junior who has received passes for more than 1,000 yards in both of his two seasons at UH. The Warriors found versatility to be a virtue last year, when Grice-Mullins injured an ankle and missed four games. Wideout Ross Dickerson, a converted slot, was able to move into Grice-Mullins' spot. Dickerson was named team MVP, partly for his multi-tasking. "We're trying to get everyone to know every position," quarterback Colt Brennan said. "Then if we get into something like we did last year, we can do what we did. And moving guys around creates another threat. Getting Davone on those outside screens, that's going to help." It wasn't Brennan's sharpest practice ever, but he wasn't as bad as he thought, either. "The first day's tough. I felt like I looked horrible," the Heisman Trophy candidate said. "Everyone feels they don't look good because it's the first day. You gotta get all those jitters out and get into shape as far as practicing every day." Brennan added that most of the players aren't worrying yet about the fact that the Warriors have only 11 of a possible 13 games scheduled for the fall. "Honestly we have way more important things to worry about. We're still trying to get soap in our locker room right now," Brennan said. "Whoever we play, we'll be ready to play and we'll be excited to play. Obviously we want the most challenging schedule, but we're going to be excited for whoever crosses our path. That's something we don't need to worry about until a week in advance." Yesterday, he was officially just an observer. But Greg McMackin is the leading candidate to become the defensive coordinator in place of Jerry Glanville. That would mean some changes, including a shift back to a 4-3 base defense. Linebackers and defensive linemen will be affected the most, as well as some coaching responsibilities. Solomon Elimimian appears set to remain in the middle at linebacker. Adam Leonard, the other starting inside linebacker and the leading tackler from last year, appears poised to take on the strongside linebacker duties. As he did when UH switched from a 4-3 base to 3-4 in 2005, Jones said most of the changes are cosmetic. "Really, it's all the same stuff we've been doing, with some different calls and stuff. All the guys have done it all," he said. "(The defensive ends) are really our outside backers. The context is exactly the same. It's not any different." A lot of yesterday's practice looked like an extended walk-through. Jones said the intensity will pick up after the first week. "We can't put pads on for another three days," he said. "We're kind of just making sure the new guys know what they're doing before we put them in there with helmets and shoulder pads on." Two more practices are scheduled for this week, tomorrow and Thursday.